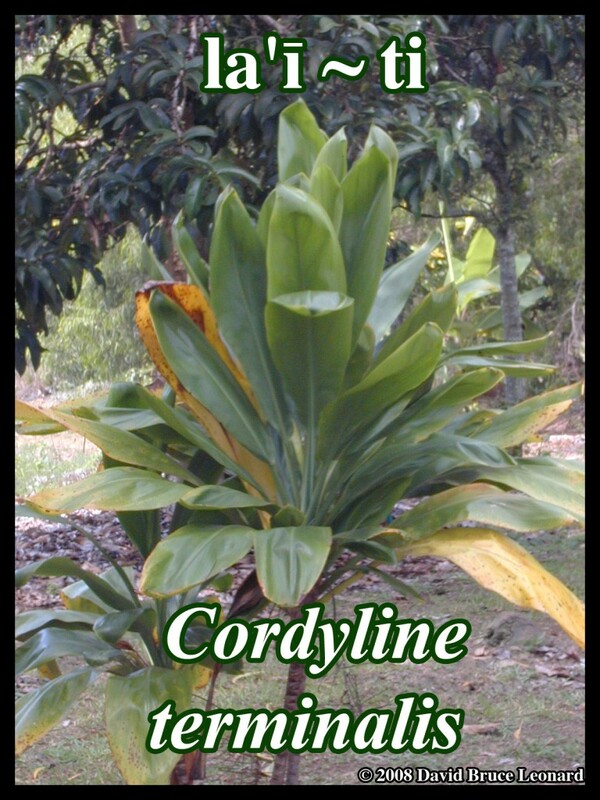 PLANT NAME: Cordyline fruticosa (L.) A. Chev. COMMON NAMES: Lä’ï, kï [Hawai’i]; ti [USA];asikuga [Solomon Islands]; cana la india [Venuzuela]; Dracena, bloddracena [Sweden]; jeluang [Sumatra]; litik, idahan [Borneo]; mak pu mak mia [Thailand]; sawang [Borneo]; si [Tonga]; ti kouka, cabbage tree (Cordyline australis) [New Zealand]. The lä’ï roots were boiled or baked and made into food, a sweet candy, and into a fermented drink. The leaves were used in Hawai’i to preserve breadfruit. Also used for cooking in underground ovens (called an ‘imu) in Hawai’i, and as a sweetener in Fiji. While the leaves of various introduced and native New Zealand Cordyline reportedly have been eaten by the Maori [Cambie 2003], it would be hard to find an edible preparation for lä’ï leaves unless one is eating the young shoots. RANGE: Globally, tropics and sub tropics. Native to tropical Asia, or possibly the Himalayas. GATHERING: Kinolau of Käne and possibly Lono. When possible, I always try to gather lä’ï before other herbs and use it as a gathering lei and medicine bundle. The lei may be offered as a gift to Wao Akua (the forest), or worn to purify the gatherer. As a medicine bundle, it is given to the patient, who removes the herbs for preparation and then replants the “wrapping” in their yard, where it will grow as a reminder of their healing process and relationship to the divine. PROPAGATION & CULTIVATION: Place a broken stem in the ground and watch it grow. TOXICITY: Some leaves are reported to contain calcium oxalate raphides, so they should be cooked. However, the young raw leaf shoots are sweet and edible. CAUTIONS AND CONTRAINDICATIONS: Not recommended in pregnancy until more research is done. ENERGETIC CAUTIONS: Caution with cold Spleen / Stomach~. A symbol of purity and spiritual power in ancient (and modern) Hawai’i, lä’ï is planted around houses, made into healer’s leis, and used in ceremonial blessings. It was often grown at temples of the medicine god Lono and the hula goddess Laka. 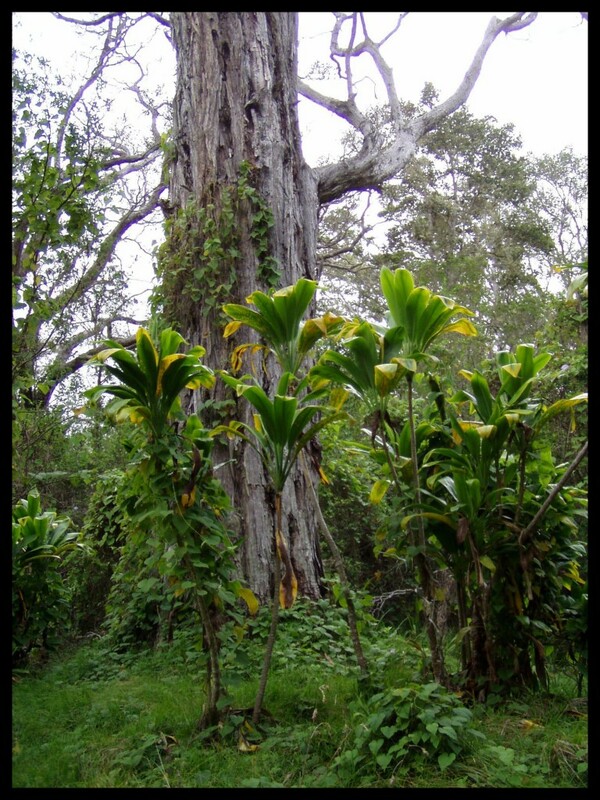 Temples to Lono were thatched with lä’ï leaves and those to Kü (the war god) were thatched with other plants.